More teachers to be trained for special-needs children. KUCHING: Only 14% of special-needs children are estimated to be registered in special education programmes in government schools, says Deputy Education Minister Teo Nie Ching. Calling the percentage low, she said the ministry was taking steps to train more teachers in special education and to raise awareness among parents in order to increase the number of special-needs children in school. “It’s very important for us to encourage more parents to send their children to school so that we can ensure that they also have the chance to receive education. “I think publicity and awareness are very important. Teo said the ministry was working with Permata to design online courses for mainstream teachers to equip them to handle special-needs children in their classrooms. “We will train more teachers in special education. We want to take in more special-needs children, so we need to make sure our facilities and teachers are available and capable to take care of this group,” she said, adding that the online courses would be launched soon. In addition, she said the ministry would continue to promote its zero-reject policy for special-needs children as it wanted as many of them as possible to go to school. As at Jan 31, 83,039 special-needs children are registered in government schools nationwide. In Sarawak, there are 5,804 registered special-needs children as at Jan 31, up from 5,766 last year. Of this total, 147 are registered in Sekolah Pendidikan Khas, while 4,432 are in the PPKI programme and 590 in the inclusive education programme (PPI), in which special needs children attend mainstream classrooms. Teo said the ministry wanted to see progress and improvement among special-needs students as they attend PPKI and PPI classes. “When they progress further (in the PPKI programme), we will put them in the inclusive programme. “We believe that by putting them in the mainstream classroom, it’s not only advantageous to the special-needs children because it can build up their confidence, but at the same time it’s good for the normal kids to appreciate and learn to assist those with different abilities. SCHOOLS must accept all special needs students and prepare an individual education plan for every child under the Education Ministry’s “zero reject” policy, which has been made compulsory starting this year. The ‘zero reject’ policy is to ensure that all special needs students have access to education, the ministry said in a circular issued on Dec 26, 2018, while Education Minister Dr Maszlee Malik previously said that it is also an effort to prevent dropouts among students with disabilities. While the ministry is working towards a more inclusive environment for special needs students, what are the types of training given to its teachers to identify cases of developmental delay, at a preliminary stage, and refer them to medical practitioners? Education Ministry Special Education Division deputy director Datuk Dr Yasmin Hussain explained that teachers are trained on how to screen and identify in terms of the child’s learning abilities, behaviour and emotion, among others. Types of developmental delay include cognitive delays, motor delays, speech delays and social, emotional and behavioural delays. “In institutes of teacher education (IPG), they are exposed to early childhood education in the curriculum; they are also taught how to conduct intervention for children with disabilities. “It’s a three credit subject, 45 hours per semester,” she shared. Rembau MP Khairy Jamaluddin suggested, during a parliament session last year, to train preschool teachers to screen special needs children and refer them to experts for subsequent diagnosis and intervention. In response, Dr Maszlee said the ministry has been training teachers, including preschool teachers, through a programme called Continuous Professionalism Enhancement Programme for Teachers. Explaining further on a Facebook post, Dr Maszlee said he has instructed the ministry’s special education division to hold open courses for preschool teachers outside the ministry’s administration. “We have also worked with the Women, Family and Community Development Ministry, and the Health Ministry to set up a Baby and Child Development Checklist to conduct screening for children,” he added. There are multiple tools the ministry has, Dr Yasmin shared, which teachers use to screen pupils and students. To keep up with new developments, the ministry reviews these tools regularly. “The Instrumen Senarai Semak Perkembangan Kanak-Kanak, for example, is an instrument used by preschool teachers to screen children aged up to six years-old, to check on the child’s development. “They will then refer the results to medical practitioners or doctors (if they have detected a sign of developmental delay). The ministry also has a centre called Pusat Perkhidmatan Pendidikan Khas (special education service centres). There are 13 throughout the country with 28 medical practitioners, five of which are psychologists, said Dr Yasmin. “Either parents refer their children to the practitioners in our centres, or they will go to schools to identify pupils and students (with possible forms of developmental delay). “They are also often invited by schools to give talks and training,” she added. In 2017, the ministry trained 210 teachers, she said, while last year, 52 were trained. The training sessions are conducted around four times a year, between two to three days. “Teachers have said that it isn’t enough. “We try to have as many as we can in a year but we can’t take them away from school for too many days; other teachers will have to replace their classes and (this is tough), especially for special education teachers,” she said, adding that only about 30 teachers can be trained in each session. However, plans to train more teachers this year are on the cards, she said, involving about 200 preschool teachers. Dr Yasmin said the ministry has discussed with the Health Ministry, as well as the Women, Family and Community Development Ministry and Permata Kurnia, an NGO which provides education for autistic children, on how to best utilise the tools they currently have. While tools and training for teachers to identify, screen and teach students with learning disabilities and developmental delay are provided, parents play an equally important role in accepting their child’s condition. To push for this, Dr Yasmin’s division conducted a town hall last year where teachers and communities were present. This year, she said plans to conduct a convention on special education with NGOs are in the pipeline. Commenting on scenarios where parents deny their children’s condition, Dr Yasmin said some request special services for their child in schools but will not register to receive the Disabled People’s (OKU) card for the child. “Some do not want their kids to be classified as OKU, although, off late, more parents have been accepting reality. Often, parents of specially abled children want their kids to be in mainstream classes in schools. When this happens, Dr Yasmin said schools will not be able to provide special services that special needs students normally receive. “In terms of providing material with enlarged prints and giving them more time during exams to answer. “Problems also arise for mainstream classroom teachers – unless this special needs student has been in our integrated programmes where we teach them how to manage their behaviour and learning methods, and they then show us that they are able to (integrate) with their mainstream classroom peers, then it would be easier for teachers to manage,” she shared. Last year, Dr Yasmin said the ministry trained around 220 teachers in the integrated programmes. Previously, training were more general so this year, Dr Yasmin said they plan to have it in more focused and specific areas such as autism, Down Syndrome and cerebral palsy. Often, she said, parents have voiced their concerns over wanting teaching and learning to be more specific. Although the curriculum in IPGs are credible and comprehensive, Dr Yasmin said teachers “must learn more on their own initiative after graduating”. National Union of the Teaching Profession (NUTP) secretary-general Harry Tan agreed, saying as professionals, teachers must consistently undergo continuous professional development. “This is paramount for us to teach using the latest methods and understand the developing needs of our students. “As there are various kinds of special needs, it is up to the teachers themselves to further improve on the basics they have been taught so as to cater to the Zero Reject Policy,” he said. Tan said teachers also need to have counselling skills, in assisting parents of special needs children. Special education teacher Dr Muhamad Khairul Anuar Hus­sin said relying on the basics one learnt in college isn’t enough as under learning disabilities alone, there are more than six categories. The SMK Taman Uni­ver­siti 2, Johor Baru teacher often attends international conferences, reads up on latest research in the area and learns from his specialist friends. Malaysia Mental Health Asso­ciation president Datuk Dr Andrew Mohanraj said teachers must be able to detect cases using multi sensory screening material. “Don’t just focus on behaviour or academic performance. “In our current culture of being focused on the completion of the curriculum, it leaves little room for personalised and meaningful student-teacher relationships and therefore makes detection and subsequent referral of cases rather challenging and often overlooked. “Teachers being given adequate training will help in early detection and result in better outcomes for any intervention,” he explained. While several training modules are used internationally for preschool teachers to detect developmental delay and psychological issues in children, Dr Andrew said the Montessori Multi Sensory Screening System has been a more successful model. “It’s a teaching system that focuses on all the sensory modalities but in the process, picks up developmental delays and other underlying psychological and psychiatric issues. “It cannot however be used as a diagnostic tool and only as a screening tool to pick up doubtful cases for referral,” he shared. HIS love for children is clearly evident as tears well up in Dr Maszlee Malik’s eyes when he talks about creating a better education environment for Malaysia’s children, especially those with special needs. The current Education Minister shares that this desire to help special needs children stemmed from the days he was on a sojourn in the United Kingdom. He reveals it started in December 2010, when one of his daughters pointed out how a TV show presenter “is going to heaven” because he was helping and entertaining children with disabilities prepare for Christmas. “I felt very touched. So, I’m trying my best as Education Minister to do something for those children,” he says, as he dabs his eyes with a handkerchief. Dr Maszlee also revealed that there is an RM146mil allocation in Budget 2019 for special needs education. An amount, he adds, that is better than the previous years. Dr Maszlee (third from left) chats with pupils after presenting them with new school uniforms, shoes and bags for the new school year. McDonald’s Malaysia managing director and local operating partner Azmir Jaafar (left, back row) looks on. He says the allocation will be used to improve the facilities, the teaching and learning process, and to improve the quality of teaching for special needs students in schools. Dr Maszlee says that it broke his heart when he visited schools and found out that some students did not have breakfast at home, and have to wait until recess time to eat their first meal of the day. He adds that this is why he has suggested a programme to provide a nutritious breakfast to children from the B40 group. This, he adds, is better than the ongoing supplementary food programme that was introduced by the ministry in 1979. The new programme will provide breakfast to the students at the beginning of the school day, and not halfway through. “I will try to negotiate with the Finance Minister for a supplementary budget,” he explains. Although he does not get to spend much time with his family, Dr Maszlee says breakfast with them is a must. “I miss sending my children to school as I used to do so previously,” says the father of three daughters and a son aged between nine and 19. (Left) Reverend Datuk Dr Charles Samuel with Dr Koh (second right) and Dr Zoraini (right) watching S. Gomathi on the e-learning system. TO make education more accessible and equitable for the blind and visually-impaired (BVI) students, Wawasan Open University (WOU) and St Nicholas Home for the Blind have signed a memorandum of agreement (MoA) to make web accessible e-learning educational resources available to BVIs. WOU acting vice-chancellor Prof Dr Zoraini Wati Abas said that WOU was committed to provide knowledge transfer services to St Nicholas Home through technical support on server-related issues and consultations on Learning Management System (LMS) related issues. She said this would enable teachers of the home to share their learning resources with the visually-impaired students to enhance their knowledge and skills in attaining higheracademic qualifications throughout Malaysia. “With the LMS, learners can have discussion with their peers, tutors and course coordinators. St Nicholas Home’s executive director Daniel Soon said there were several challenges faced when setting up the system two years ago. He said that the home had a hard time getting materials such as large print or Braille as they were not available or accessibleto the blind and visually-impaired people. “We also faced difficulty in translating the resources from text to Braille as the process of scanning the books was tedious and efforts to translate required help from trained members,” he said. He also pointed that the constant change of materials by the Education Ministry had made it hard for them to source for informations. Kumon instructor Nor Aishah said children who face challenges daily will discover solutions themselves and end up feeling better for their achievement. WHEN it comes to assessing a child’s success in school, many recent experiments and tests conducted by child psychologists suggested that rather than brain power, the solution lies in the child’s character. These results reveal that non-cognitive skills like persistence, self-control, curiosity, conscientiousness, self-confidence and grit are the reason for the child’s success at school and in life later on. Grit itself refers to the passion and perseverance for long-term goals despite setbacks. Kumon instructor Nor Aishah Osman said that when it comes to grit, a student cannot become an advanced learner without strengthening his learning skills. At Kumon, experience is crucial to moulding a child’s character and it usually starts off simple enough by solving easy solutions, before progressing to problems at the student’s right level, which implies the process being individualised. Once the student surpasses his own level, there is no stopping, as he can continue to challenge himself in higher levels than his own in school. Kumon worksheets are planned in such a way that they are a step-by-step guide, with new twists and elements added so students are exposed to different components of the solutions to a complicated problem. Nor Aishah said that this form of self-learning requires patience. “Some children get frustrated when trying to solve the problems,” she added. But when they persist and face these challenges daily, they will eventually discover the solution themselves and end up feeling better for their achievement. “This gives them motivation, self-confidence,” explained Nor Aishah. Working with parents, Kumon instructors help shape the attitudes and confidence early so that student are self-reliant by the time they enter college. R&D development manager Rupeshsingh is happy with his daughter Dhaani’s progress at Kumon. When Rupeshsingh K. Bess enrolled his five-year-old daughter Dhaani in Kumon, his expectations were that she should inculcate good learning habits and develop better concentration — both traits that after just 18 months have become intrinsic to her. Daani has already developed endurance, and she relishes spending 15-30 minutes each day dedicated to working on her mathematics and English worksheets. “She is committed and she looks forward to working on even more homework,” said Rupeshsingh, research and development manager. “She has developed the tenacity to want to achieve more,” he concluded. Final level Kumon student Aleem (left) with his father Amirullah Harun, is a straight-A student at school. For straight-A student 15-year-old Aleem, being at Kumon made a big difference when he progressed towards secondary school. His father, quantity surveyor Amirullah Harun, enrolled him at the age of five-plus. “By then, there was already a big gap between me and my classmates, for when I was in Form 1, I was already working on trigonometry while my classmates were still figuring out algebra. “My mindset about fear has already been changed thanks to Kumon,” Aleem added. Kumon’s main objective is for primary school children to be able to tackle secondary school materials by strengthening their foundation before proceeding to higher level work. ISLAM enjoins Muslims to always respect others, regardless of their abilities, skin colour, etc. We are urged not to hurt their emotions and feelings as this would lead to disharmony. Allah says in the Quran, Verse 2 of Surah al-Maidah: “… help one another in righteousness and piety, but help not one another in sin and rancour”. Islam, as a way of life, is prolific in its teachings and legacy, as well as heritage, when it comes to the treatment and management of people. correspond to the type of disabilities they have. They are a part of society and deserve all the facilities, rights and respect the others receive. Disabilities come in different forms. Some individuals may have physical impairments and limitations that restrict their ability and strength. Others may have disabilities that are not obvious to us. As such, we cannot use the same yardstick to deal with them. People with disabilities may look normal outwardly, but the fact is that they are special and require special treatment with a specific approach. Why do we need this special approach in the first place? Because there is none that can help us to deal with people who are differently-abled. Such an approach or standard operating procedure (SOP) would guide us to respond to them with the dignity they deserve as human beings. Furthermore, such an SOP protects us from inappropriate behaviours towards them. The SOP also protects people with disabilities as it upholds their sense of dignity, respect and rights as humans. By Khairul Azhar Idris . Gamuda Foundation’s Enabling Academy prepares autistic trainees for employment. PETALING JAYA: Deputy Women, Family and Community Development Minister Hannah Yeoh lauded Gamuda Foundation’s move to establish Enabling Academy training centre to cater people with Autism spectrum disorder (ASD). Yeoh said the government supported efforts by companies in assisting people with special needs. “Instead of establishing more training institutions, the government would fully support the corporate social responsibility (CSR) initiatives by the private sector,” she said at the academy launch at Menara Gamuda today. She said a total of 474, 579 disabled people were registered with the ministry until June. “Of the total, 862 people have found jobs between Sept 2012 and July this year. “A total of 489 companies hired the disabled people,” she said. During the event, graduation ceremony for 11 trainees from the September intake, last year, was also held. Gamuda Bhd Group director Datuk Lin Yun Ling said the academy was established to train those with ASD and provide job opportunities including the academy’s 14 corporate partners. Among them are CIMB Bank, DRB Hicom, Lafarge Malaysia and Gamuda GM Klang. Lin said a total of 30 autistic people received training at the academy since it started operation in May 2017. “Gamuda itself has hired 20 people with disabilities in administration, engineering and Information Technology (IT). “We also hope that more government departments would spearhead efforts by setting up more employment transition centres through renewal in policies and strategies. “This will enable more people with special needs to have better quality of life with permanent jobs,” he said. By Nor Akmar Samudin, Zarul Fitri Muhd Zamrie. See us – it’s the way we speak. “Every time we raise the issue with the ministry, we are told that there is a KTBM policy in place so most teachers continue to shun BIM. Hopefully the new Education Minister can make BIM mandatory for the good of our children..
KUALA LUMPUR: Deputy Prime Minister, Datuk Seri Dr Wan Azizah Wan Ismail has assured that the welfare of the disabled people will continue to be protected, through various community-based programmes and services. She said this was apparent with the setting up of hundreds of community-based rehabilitation centres across the nation. 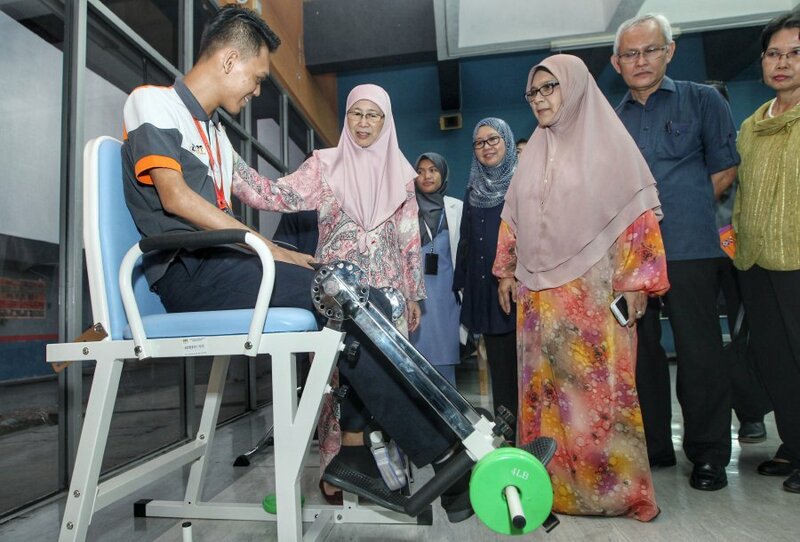 Dr Wan Azizah, who is also Women, Family and Community Development Minister said 551 such centres have been established nationwide, aimed at getting persons with disabilities back on their feet. “The programmes are to meant to give the disabled equal opportunities and for them to integrate into society, through programmes and rehabilitation activities, as well as community-based education,” she said. She said this when visiting the Bangi Industrial and Rehabilitation Training Centre (PLPP) today. The competition was aimed at selecting disabled athletes to represent the country at the 10th International Abilympics in Shanghai, China in 2020. You are currently browsing the archives for the Persons with special needs category.